Plan of parts of Tilbury Fort. The fort was built in the 17th century and was designed by Sir Bernard de Gomme. It was the first line of defence for the Thames and London. 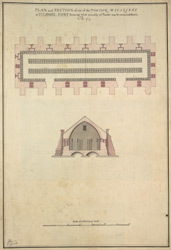 Modifications were made in the early 18th century to bring the fort up to date and these plans are part of the proposals for the work that needed to be carried out. The powder magazines were built in 1716 and at first they were not subdivided so the large spaces could hold considerable amounts of gunpowder. The roof would have been pitched and made from timber and covered with lead.